This is one of the three hot water heaters we have in our home. Obviously, it's installed at the top of a wall in our storage closet. This one supplies the hot water for both of the bathrooms in our flat. The other two are installed in a similar spot near the ceiling in the kitchen and laundry room. This is quite different for me. 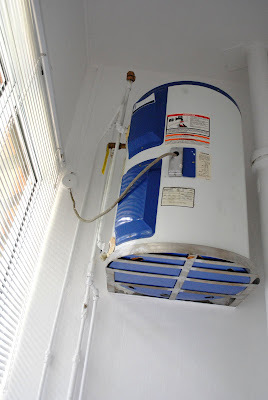 In the States, it's most common for a home to have one big water heater that supplies the whole house with hot water, rather than several small ones scattered about. Also, these types of things are put in our basements or laundry rooms and are tucked out of the way where you don't see them as easily. I'm sure the layout and older construction of our current residence made a large water heater difficult to install in a semi-secret place, so they gave us three, all out in the open. It's fine with me, most of the time. However, the water heater for our bathrooms is located in a storage room right above where we store our luggage. We found out very quickly that it leaks. Then, on top of that, we realized that when both of us want to take a shower in our own bathrooms at the same time, hot water lasts for about two minutes. The small heater is just not made to handle two pokey shower takers at once. It's a no bueno type of situation. Nothing puts me in a crabby mood quicker than a cold shower...no matter how hot it is outside. I'm not complaining though. From what I've discovered, a lot of people in Singapore don't even have what we do. 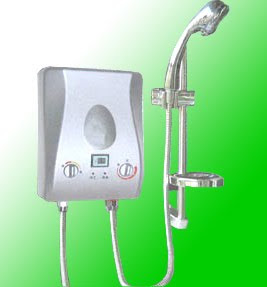 It's a hot water heater that is installed inside your shower. That square-shaped thing is the tank. Can we say TINY? Imagine how quick those hot showers must be. I'd be an angry elf everyday. How do you take a hot bubble bath with that thing? Do you fill it a little at a time? Wouldn't it get cold before you even get it full? Do they just not take hot bubble baths? How could you live in a world without hot bubble baths? I just can't accept that as an answer. They must have another way. actually, those tiny water heaters work much better than the huge tanks. it doesn't store hot water, it heats up the water as you run the tap on. so you'll never run out of hot water for a hot shower. The small water heaters quicly heats water as it flows thru. so it's actually more efficient because when you turn it on, that's the only time it heats the water up. When you're not using it, no energy is required at all. like the previous poster said, it doesn't store wateer at all. So basically what you guys are telling me is this: I need to invest in one of these gadgets pronto. Sweet! Thanks for the clarification!!! Do you have the switches to turn the hot water on? I hate having to get up 15 minutes earlier in the morning to turn on the water heater so you can have a hot shower in th morning. We have two of those small water heaters in our condo. One for the kitchen and master bath and one for the laundry and second bath. I would definately look into the little quick heater upper device. I have only taken a hot bubble bath... once... in my entire life. The two places I've lived in Singapore only had one water heater about that size for the entire place. It's a hassle. It's even more of a hassle when you live with people who think it's a mortal sin to preheat the water for your shower and sneak out and switch it back off behind you. I hate these little water heaters with a passion. The last good, hot shower I had was in a hotel in Phuket, Thailand last year. My wife thought I'd died in the bathroom because I was just standing there in the shower for about 30 minutes. Ya, like the other folks said Megan, that little one heats the water on-the-fly, so it's great. I should've bought one, but living in a rented place I didn't think it appropriate to mount things on the wall. I'll definitely be picking one up when we move to Manila though. Interesting post. I've never seen or heard of the small heaters you posted. I live in a very new condo so I guess I should consider myself lucky in that our water heaters must be hidden somewhere b/c I've never seen one in the actual condo. We have switches to turn the hot water on and off, but we can turn them right before our showers and the water gets hot within a minute. Plus, we can have 4 people shower within 20 minutes and everyone's water stays hot. Thanks for giving me something to be thankful about totoday! When I went to India they had the hot water heaters with a switch, it seemed like no matter HOW LONG i waited for the water to get warm it never did.